Starring; Jennifer Lawrence, Elisabeth Shue and Max Thieriot. A recently divorced mother Sarah (Elisabeth Shue) and her teenage daughter Elissa (Jennifer Lawrence) move to a new town and find the house of their dreams. This small, upscale, rural town seems perfect at first, but then startling and unexplainable events begin to happen and lead to a gruesome discovery that the house next door was recently the scene of a horrific double homicide. Sarah and Elissa learn that the town is in the shadows of a chilling secret when Elissa, forges a close friendship with the boy who cheated death (Max Thieriot) on that fateful night, in this new tale of terror from HUSH director Mark Tonderai. 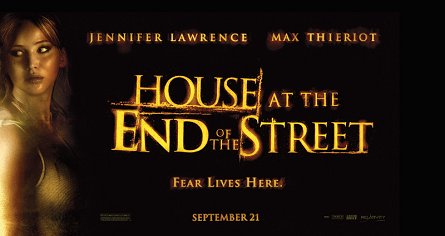 HOUSE AT THE END OF THE STREET Coming September 21, 2012 from; A Bigger Boat, FilmNation Entertainment, Relativity Media, and Zed Filmworks. This film has been Rated PG-13 for intense sequences of violence and terror, thematic elements, language, some teen partying and brief drug material by the Motion Picture Association of America.